The Cherokee Rose (Rosa laevigata) is the state flower of Georgia. 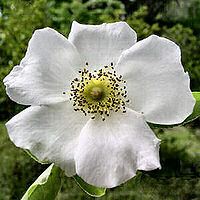 The name "Cherokee Rose" is derived from the Cherokee Indians (Native Americans) who widely distributed the plant. The flower also grows in surrounding states. The flower has white petals and a gold center. It is an evergreen climbing rose that grows to about 10–12 ft (3-3.7 m) in height and about 15 ft (4.6 m) wide.